Subterranean termite (white ant) damage is a significant concern throughout mainland Australia. Each year the cost of repairing termite affected timber amounts to tens of millions of dollars. Infestation in some areas is greater than one in five houses. As a result, the Building Code of Australia makes it compulsory to provide a termite barrier to protect structural timber in new buildings. To leave any timber or timber product unprotected is a real risk. from termites. It uses durable materials to form tough termite barriers that provide a safe and effective alternative to the use of dangerous residual poisons or less sturdy physical barrier systems. Granitgard provides a barrier to protect ALL timber products in the building (not just the frame). 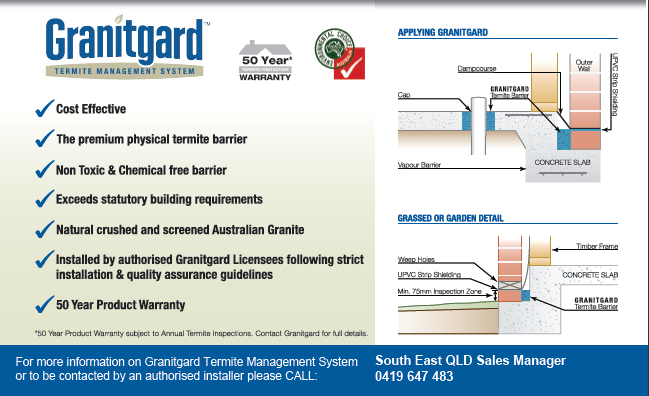 Granitgard offers a complete subterranean termite barrier system. With a wide range of treatment options, a minimum of disruption on site, an insulative value and optional use as an underslab fill replacement Granitgard can suit any budget and provide real savings. Being a one-off cost Granitgard is an investment in the building that does not require expensive, on-going retreatments. A comprehensive warranty covers ALL timber in the building for termite damage that is the result of either faulty installation or imperfect materials for up to ten years. Optional life-long insurance is also available. Granitgard is an investment that adds long term value to your new home. Granitgard is placed around building perimeters, providing a flexible, long-life termite barrier for these highly vulnerable areas. By surrounding each pipe with a collar of Granitgard, this common termite access point is blocked. The Granitgard remains flexible and allows for independent ground, slab and pipe movement. These design features are not incorporated into all buildings but where they are termites often use them for access. Granitgard installers offer a number of approved treatment methods to protect these hidden areas.